We finally got there. The third attempt wasn’t cancelled. Kapiti Island was sunny and with appropriate charm. Last Sunday morning we drove out early at the Kapiti Boating Club, from where both ferry companies leave, and caught our ferry over to the island. 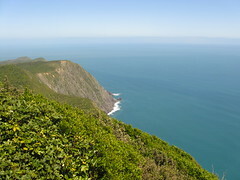 Location: Kapiti Island, Rangatira Point to Tuteremoana Trig and back. Kapiti Island has a varied and sometimes violent history. It was the base from which Te Rauparaha ruled much of the lower North Island and upper South Island of New Zealand. With the island being relatively central and accessible to the Cook Straight, he used its strategic location to secure trading opportunities with visiting sailing ships, and this gave him a huge advantage over other Maori tribes, as well as giving him a higher status. Most of the island has been farmed in the past, and the bush that covers most of it is still re-generating. The island has been tagged as a wildlife sanctuary for more than a century, but conflicting priorities, administration difficulties, arguments over its future and land ownership issues have meant that it’s taken a long time for effective work to eventuate. The last of the rats on the island were finally eliminated in 1998. Since then, the trap-laying tracks that used to cover the island have been allowed to become overgrown once again, endangered species have been re-introduced to the island, and the entire place has been set aside for native wildlife. 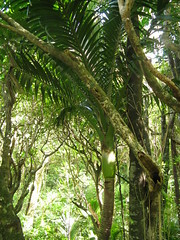 In its current state, Kapiti Island is now one of New Zealand’s highest priority island sanctuaries. It’s unusual in that it’s so accessible, and that DOC allows members of the public to visit it at all. In its present state, there are only a small number of formed tracks remaining, and all visitors are asked to keep to these tracks so as not to risk disturbing the environment. Of the two places where visitors are allowed to land on the island, Stacey and I went to Rangatira Point. From here it’s possible to walk to the Tuteremoana Trig. At 521 metres, it’s the highest point on the island, and when standing there it’s possible to look over the top of the wind-blasted cliffs on the western side. We didn’t really visit Kapiti Island to walk to the top, though, and ended up walking very slowly to enjoy the scenery and the birds. (In fact, of the 30-odd people visiting that day, I think we were almost the slowest.) Even though we weren’t there in the early morning or evening, it’s certainly true that bird songs are much more prevalent on Kapiti Island. Some of the birds seem much less afraid of people, too. On several occasions, we had North Island Robins hopping around ahead of us, which I’m not used to seeing in other places. People are asked not to feed the birds, but I’m sure they must coax food from the occasional tourists judging by the interest the Kaka had in us when we landed. For the walking details (which I try to include in these write-ups), the Kapiti Tours boat arrived at the island at about 9.30am. After the standard summary talk about the island sanctuary, we started walking up the Trig Track at about 10am. It’s possible to do a loop up to the trig by following both the Trig Track and the Wilkinson Track, and this is what we did. The Trig Track is quite steep, though, full of tree-roots and often slippery. I’d left my tramping boots at home on this occasion, but I think they would have been quite beneficial on the Trig Track. It’s no worse than a typical tramping track in many places around New Zealand, but between the two of them it’s much steeper and more difficult, especially coming down where it’s probably easier to trip over. Because of this, it’s generally recommended to walk up the Trig Track and down the Wilkinson Track if doing a loop. The WIlkinson Track has many more switches and a more shallow gradient with less kinks in it, so is easier to come down. Half way up the Trig Track. The loop of the two main tracks is completed at a junction (with a picnic table) about 100 vertical metres from the top before they join back into a single track to the summit. When climbing the Trig Track to this point, we stopped for a while at one of the three bird-feeding stations. They’re a good place to watch for Stitchbirds, although there seemed to be a lot more Bellbirds fluttering in and out at the time. A resident DOC person was patiently sitting there watching for them, and I was self-conscious of getting in her way, so we didn’t stay for too long. hanging around at the top. We eventually reached the junction with the Wilkinson Track at about 11.40’ish, then headed up to the summit, and on the way we saw the first of many Weka, which was quietly and tamely sitting on the side of the track and acting as if it’d rather be asleep. Above the junction, the track becomes much more graded again with many switches, and we reached the Tuteremoana Trig just after midday, where we met a collection of other people having lunch and taking photos of some more active Weka, which were waddling around trying to get into people’s food. The trig itself has a ladder to a viewing platform which reaches just above the trees, making it possible to see back to the main-land in the east. The view out to the west is very blue, and I imagine it’d be an extremely windy place to be standing if the weather were unsettled. On this occasion, though, everything was very calm. My LINZ topo map shows a cliff-top track heading north from here, but there was no sign of it. I’d guess that it’s probably closed to the public at the very least by now. We stayed at the top for about 30 minutes and then began to head down, finally reaching the point at the bottom, where the two tracks meet again, at about 1.40pm. 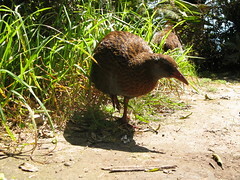 We noticed a lot more Weka brushing around in the trees on the way down — I’m not sure if this is because they’re more prevalent on the Wilkinson Track, or if it’s just because we were more tuned into their presence by that point, or perhaps it was a time-of-day thing. From here, rather than go directly back to Rangatira Point, we followed the alternative diversion route around the coast (just a small part of the coast), which takes about a further 10 minutes, and spent a lot of time sitting in the sun as we waited for the boat to come and collect us. Another bird we also saw a lot of was the Kereru (the NZ Pigeon). I often think Kereru look quite funny because they tend to sit on branches that don’t look anywhere near strong enough to support their apparent weight, but they still get away with it. 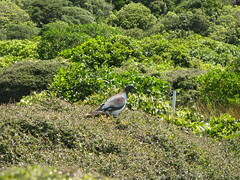 Kereru on Kapiti Island is no exception. We were hoping to see a Takahe or two around here somewhere, but none showed up while we were around. (Apparently they’re busy breeding, which makes them less likely to be out and about.) A couple of other people mentioned they’d spotted one earlier in the day, however. To top it off, our 3pm boat departure was delayed until about 3.30pm, due to some kind of engine trouble, which Stacey noticed the guy fixed with a twistie tie. In many ways, however, having an extra 30 minutes to sit on the beach in the sun on Kapiti Island was a nice way to end the day.